This website mainly concerns itself with the technique of photographing model ships in real water, whether it be in a specifically constructed studio tank with a painted backdrop, out upon a real sea with the real horizon and sky or a combination of specially constructed tank using a real horizon and sky. This is a process that is increasingly rare in these days of digital filmaking. The golden age was seen in the films of the 1940's and 1950's and there are still some strikingly effective examples seen in films right up to the end of the twentieth century. It will also cover model ships that have been built and photographed dry, with various methods for integrating either photographically shot plates of water, CG simulations of water surfaces and fogged in studios representing underwater scenes. 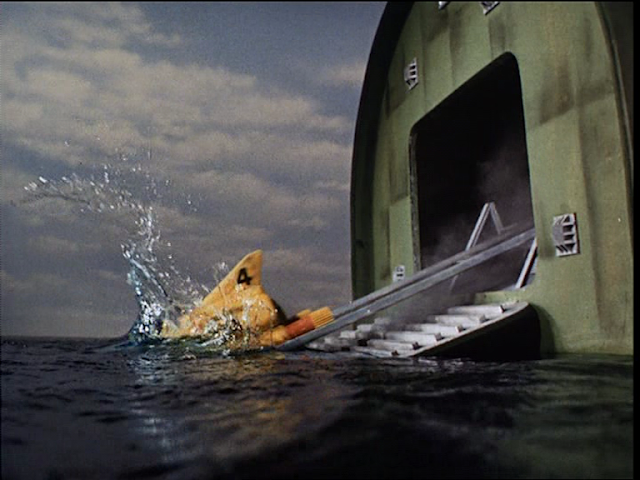 Most films today which seek to depict almost any visual effect concerned with ships upon the ocean would tend to use virtual digital model ships on a computer simulated and rendered sea. Some have still favored the building of a model, like the recent version of King Kong which had a beautifully detailed miniature steamer, built by WETA, which never got wet. Instead it was photographed in a "sea" of blue screens. It was solidly mounted to a steel rig which mimicked the rolling of the ocean as it was photographed by a computerised motion control camera. This footage was then combined in a computer program, composited with a mostly digitally simulated ocean. This was the approach largely followed by the 1997 Titanic movie, a large 1/20 scale miniature was filmed motion control and composited into a digital ocean combined with elements shot of the wake of a real ex-ww2 liberty ship. Contemporary visual effects are concerned with being "photo real". This is a recent consideration as traditional techniques were largely "photographed", thus the photo part of photo-real was automatically achieved. The real, that is to say realistic part is another matter entirely. My own take on this is that it was precisely the unreal nature of visual effects that got me interested as a child in the first place. One of my favourite films was Ray Harryhausen's Jason and the Argonauts. I loved the strange magical effect imparted by the stop motion animated creatures. I knew when a monster was about to make an entrance, as I noted a sudden change in the texture of the film just before it appeared. I just attributed it to a magical process, later realising that it was the colour shifts and extra grain caused by re-photographing the background live action off a rear projected screen. I definitely had a sense that what I was seeing wasn't real, it was better than real, it was magic. A highpoint of the film for me, was when Triton emerges from the sea and holds back the clashing rocks to allow the Argonauts' ship to pass under his arms. The wide angle lens, the low angles and the slow motion cinematography all contributed to the gigantic effect created. It was many years later that I realised that there is another ingredient that made these shots so special for me, (and probably to no-one else) and that is the size of a drop of water. Every effects person who has ever been involved in shooting miniature ships has said " you can't miniaturise a drop of water". This is a physical constant, the viscosity of water means that when you shoot a man in a fish tail suit to represent a giant mythical god at 1/25 scale the water drops are 25 times bigger than normal, about the size of an orange. This effectively makes the water seem more viscous. This apparent honey-like consistency of water in miniature shots was appealing to me ( OK I admit I'm strange ). It's one of the reasons I liked the 60's TV series Thunderbirds. 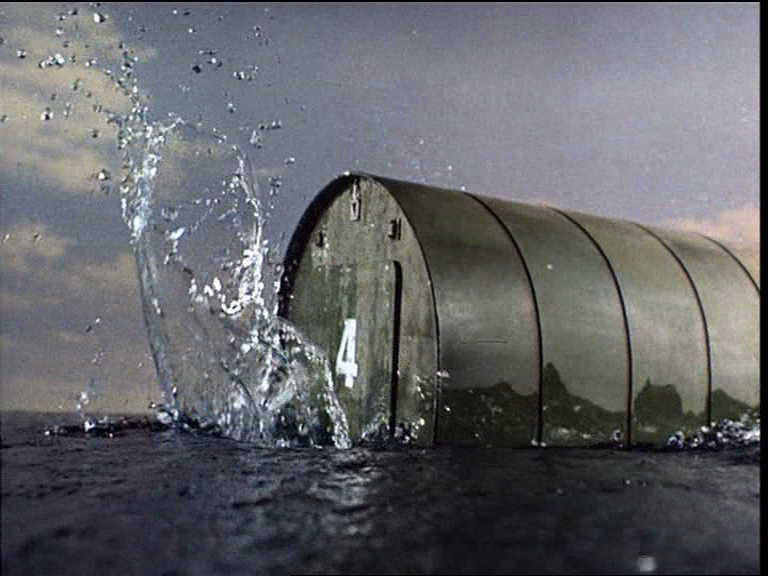 They used a very small tank, about 10 foot square, with quite small models making the water seem very syrupy indeed. Mmm... Look at those lovely big water drops. Larger Scale Pod. Same scale water drops. This is the reason most film-makers these days prefer the digital route. The water droplet size is the single most tell tale sign of a miniature effect, and consequently many techniques have been employed to get around it. I'll cover most of these strategies in later posts. 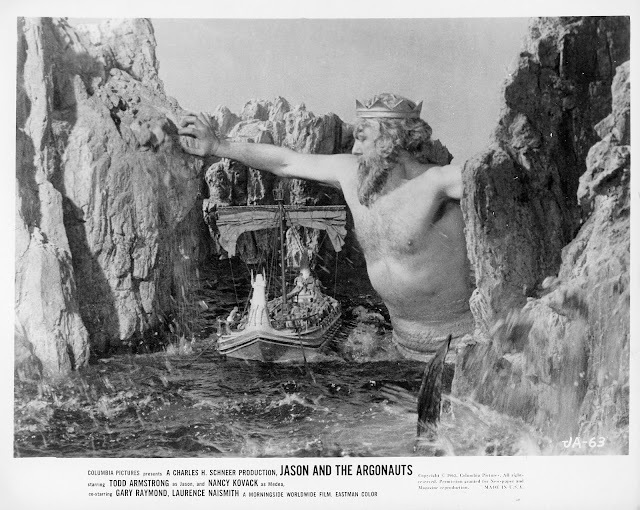 As a bit of a postscript, one of the unique features of Jason and the Argonauts, as clearly demonstrated in the photo, is you can easily tell the size of the miniature because there is a man in the shot at the same time. This is one of the few examples of this in movies other than Japanese Monster films with a man in a giant monster suit. It allows me to estimate the scale at about 1/25th of full size. In fact most giant monsters that trash cities are also at this scale. Actually 1/25 scale is a bit on the small side for a movie model ship, they are usually a fair bit larger.See my post on MODEL SCALE. If you are looking for tips on miniature cinematography, read this post Camera Lighting and Lens. When you write above about the *un*reality of traditional vfx being so appealing to you, I have to disagree when you go on to say, "...and probably no-one else"! I know exactly where you're coming from, as I find the hyper-realism of modern CGI utterly unengaging and sterile. Keep up the good work re: memorialising these wonderful old school effects films!